At the Berkeley Dulcimer Gathering you choose 3 out of 13 classes taught by 7 teachers, with subjects including repertoire, instrument care, technique, and jams. We’ll also have an instrument technician to help with evaluation and repair of your dulcimer. The day is planned for maximum time in community with up to 75 mountain dulcimer aficionados. Some dulcimers will be available for loaners and to purchase. And all the instructors will have CDs, books & other products you can’t live without! Our Faculty Concert will feature performances from Aubrey Atwater, Steve Eulberg, Deborah Hamouris, Dusty Thorburn and the Berkeley Dulcimer Orchestra,. This performance is open to the public, so bring your family & friends for a night of good music. ~ An intensive 2-period class, "Clearing the Hurdles: Moving form Intermediate to Advanced" will be offered to the first 10 students who request it by writing to berkeleydulcimergathering@djhamouris.com. This two-period class is intended to help intermediate students evaluate their current skills and add to them to become more proficient players. You’ll get Steve Eulberg’s full attention in this smaller, more focused environment. Clearing the Hurdles will be for the first 2 periods before lunch, leaving you the 3rd period for an elective. Check the skill levels for intermediate. ~ Post-Gathering Workshop with Aubrey Atwater on Sunday, 5/8: Feedback from many of you has said, “Could we have 2 days of workshops?” We have asked Aubrey to teach a class on Sunday to satisfy that itch! Please note the separate registration for this workshop. Space is limited, so sign up early! Registration entitles you to 3 classes, participation in the Dulcimer Orchestra Grand Finale, and the Afterglow Jam. 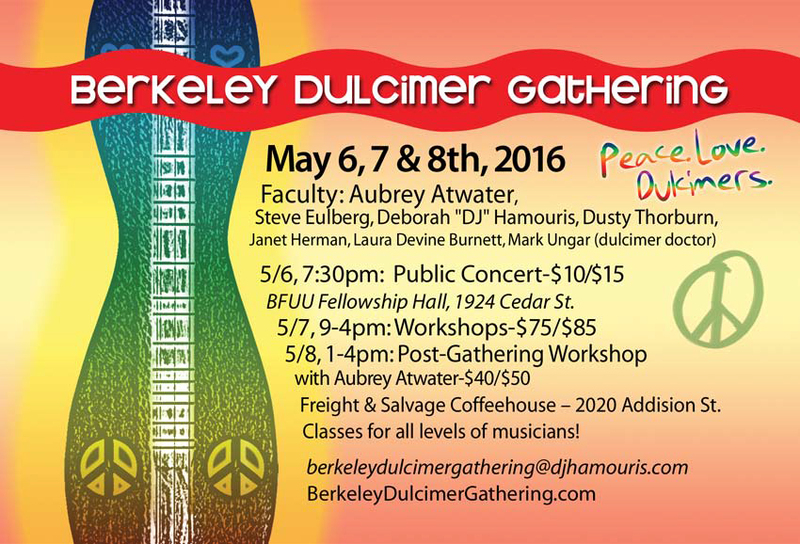 Once you register, you’ll receive an email from berkeleydulcimergathering@djhamouris.com to select classes and receive other important info about the 4th Berkeley Dulcimer Gathering. You’ve never tried one of these things before, but think it will be fun. (You’re right!) You’ve heard them but don’t know how to play them. (This one’s for you!) You love music and want to play an instrument. (You’ve come to the right place!) We’ll understand how the dulcimer works and how music works. After this class you are ready to participate with everyone else! Aubrey, an Ocean State native, will present traditional seafaring songs each in its own way beautiful, playful, tragic, or joyous. You will need a capo for one of the songs. Slow jams are a traditional way of learning songs in Irish and bluegrass circles. We will not only play slowly, but concentrate on fiddle tunes that sound great at slow speeds. Learning fiddle tunes obviously builds up your repertoire, but is also a really fun way to develop both right- and left-hand technique. 2 Part Session: for people who want to buckle down and focus. Dulcimer players tend to describe themselves as Intermediate for a long time, and often want more advanced work and options, but get stuck and struggle to clear the hurdles to Advanced Playing. This workshop will help you develop self-assessment skills and use the tools at your disposal to diagnose how to move forward and prescribe a plan to help you reach your goals, including: how to develop an arrangement for sharing, how to practice the rough spots and effectively smooth them out, and how to rehearse for performance. Finally, we’ll develop skills to assess the performance after it is complete. In this course you’ll learn some good tunes to build on what you learned in the Intro class. We’ll start with basic melodies and slowly add some interesting rhythm and basic chords. You will also receive material to work on at home and a resource list for finding tablature and videos of other dulcimer players. Aubrey will share what she has learned over the years from Jean Ritchie: creating a second voice with the dulcimer while singing. Instant duets happen when each player knows both the tune and the chord progression. Among musicians this is known as taking either the lead or the rhythm parts. Using folk and early music waltzes, you’ll learn what to do with both parts so you and a friend can have fun switching off! How and when to change strings, tune up tuners, and care for the wood of your instrument. Learn how to make decisions on modifications such as adding strap pins, extra frets, or switching out your friction pegs for machine tuners. What makes the dulcimer sound so lonesome and beautiful? One answer is tunings and modes. Participants will learn the difference between a mode and a tuning and about the different modes and where they come from. We will tune to three commonly used modes: Ionian, Mixolydian, and Aeolian. On the West Coast we often favor DAD tuning, but DAA has lovely potential for song settings, especially for the lower female vocal range. This class takes advantage of the haunting open sound of the dulcimer while tackling soulful traditional and contemporary Americana songs. Learn how to achieve nice effects with minimal movement on the fretboard. Bring a capo. You’ll learn some fun songs to jam along with others, get tips on playing lead with creative license, and enjoy singing with your dulcimer! Although singing is not required, you just might like it. The many possibilities of the mountain dulcimer are part of the beauty of this extraordinary American instrument. Moving at a comfortable pace, this exciting three-hour class will cover, as time allows: repertoire with a variety of technique including singing and playing chords, tunings, strumming, fingerpicking, flatpicking, playing by ear, improvising, and any other topics that may "happen" as a result of group chemistry. Participants will leave the class amazed with themselves and full of new ideas! Please bring a dulcimer in good playing condition, a recording device if you wish, and any other accessories. Limited to 16. Intermediate: You have the skills of the previous levels and you’ve learned the basics of strumming and reading tablature, you need to expand your playing techniques and musical theory. Learn to embellish your basic music with hammer-ons, pull-offs, and slides; to adapt an arrangement with different chord positions; to play in and modulate to different keys with and without a capo or retuning; to flat-pick and fingerpick a tune. You can play in different tunings. Janet Herman has been playing dulcimer since her teens, and brings a heap of musicality, enthusiasm and encouragement to her teaching. She co-founded Redwood Dulcimer Day in the Santa Cruz Mountains in 2001 and served as event and artistic director for its first 10 years. 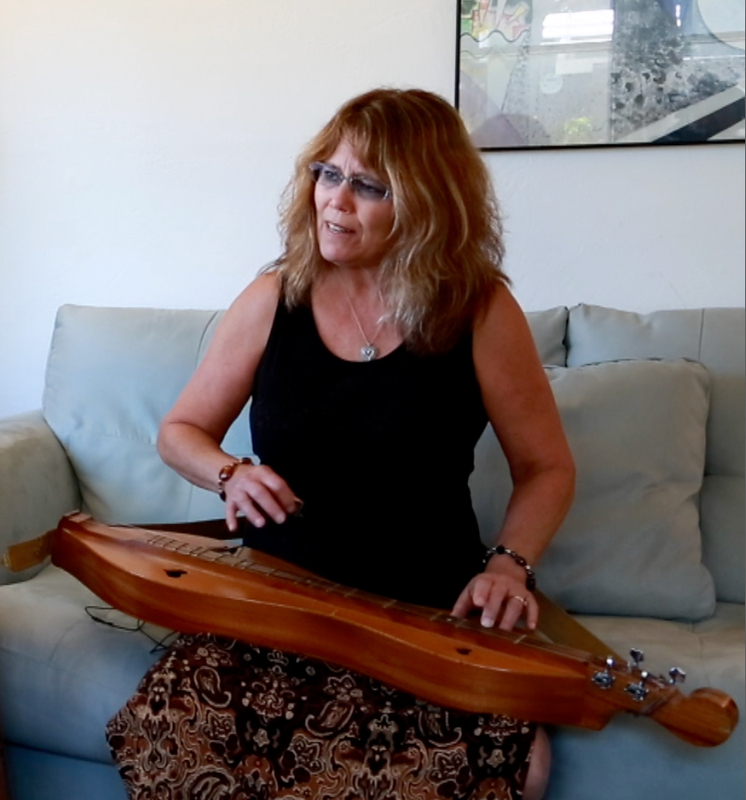 Janet is especially known for her singing, and her performance of "High on a Mountain" was one of the highlights of the documentary film Hearts of the Dulcimer (2013). She arranges songs on dulcimer from many traditions and recently co-edited Music of the World for Mountain Dulcimer with Neal Hellman. Beyond her dulcimer life, Janet holds a Ph.D. in Folklore/Ethnomusicology from UCLA and serves as writer and research consultant with the Music of Bhutan Research Center based in Thimphu, Bhutan. She also plays tenor banjo, whistle, and mandolin with the Irish band Dance Around Molly and performs and records with Zambra, a global a capella group. Mark Ungar Mark has 50 years experience playing guitar and other stringed instruments. He offers instrument repair and setup at his show in Richmond, California. He will be teaching dulcimer care, maintenance and stringing techniques at this year's Berkeley Dulcimer Gathering as well as performing repairs and string changes. Strings and strap buttons will be on sale. Laura Devine Burnett has been playing Mountain Dulcimer for over 40 years, with her first teacher being Joellen Lapidus. She was so inspired then, and continues to inspire her students to this day. 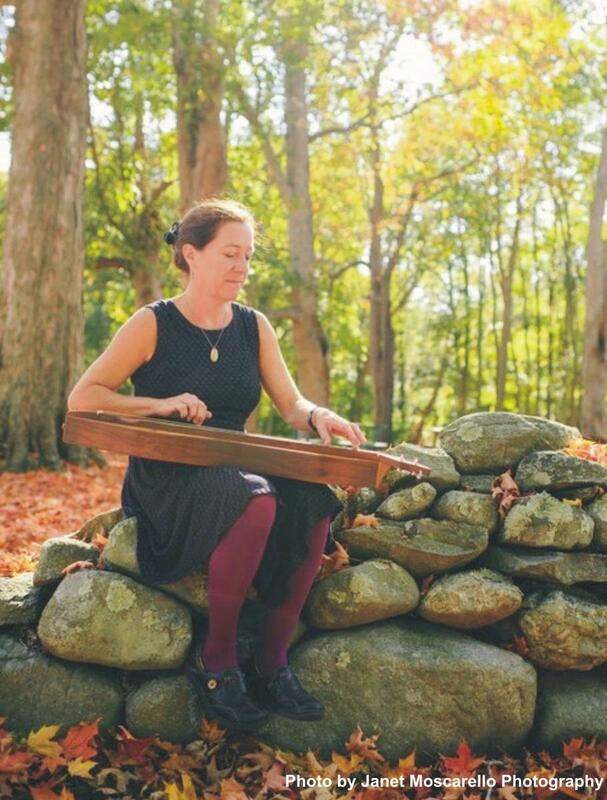 Laura is featured in the documentary Hearts of the Dulcimer which premiered at film festivals in 2013. Her former group, Dulcimer Girls, has performed at the American River Music Festival, Don Quixote's Music Hall, and Santa Cruz Museum of Art & History. Their youtube video Old Ways has over 30 thousand views. Steve Eulberg/Artistic Director 5-time national mountain dulcimer winner, 3-time national hammered dulcimer finalist, Steve Eulberg weaves old-timey with blues and contemporary tunes adding original songs into a tapestry of “smile-inducing, toe-tapping folkgrass” that captivates and energizes audiences of all ages. Steve's music has been featured on United Airlines’ Inflight Audio, PBS’s Roadtrip Nation and National Public Radio. An active touring musician, film and theater composer, he has had two recordings on initial Grammy ballot and several songs in the Top 10 Independent Country Chart reported by The Music Review. Deborah Hamouris/Executive Director Deborah (DJ to her friends) is a performer, composer/songwriter, teacher, recording artist, choral director, community organizer, and producer of musical events. She teaches mountain dulcimer classes at the Freight & Salvage Coffeehouse in Berkeley; directs the choral groups Women & Song and the Unconditional Love Choir; leads Circlesinging workshops; and teaches private voice, dulcimer, and songwriting students. With Steve Eulberg, Deborah co-founded the Berkeley Dulcimer Orchestra in 2014. Musically versatile, she performs as both a jazz vocalist and a traditionally-influenced songsmith, with her dulcimer. Musically versatile, Deborah performs as both a jazz vocalist and as a traditionally-influenced songsmith with her mountain dulcimer. Occasionally, she allows her classical music education to sneak in to her repertoire.